"Life is like a flute. It may have many holes and emptiness but if you work on it carefully, it can make beautiful melodies." 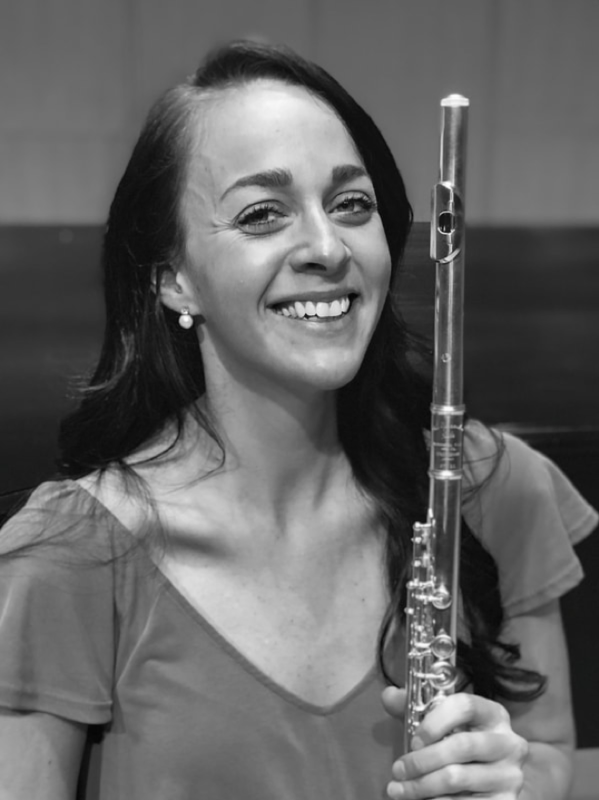 Dr. Emily Roberts, native of Augusta, Georgia, is an avid teacher and performer of flute across the Hampton Roads area. She is currently the adjunct professor of flute, music appreciation, and music history at Tidewater Community College in Norfolk, Virginia. Emily holds degrees from Michigan State University (D.M.A. ), the Meadows School of the Arts at Southern Methodist University (M.M. ), and the University of Georgia (B.M. Music Performance and Music Therapy). Ms. Roberts' previous teachers have included Richard Sherman, Angela Jones-Reus, Kara Kirkendoll Welch, Deborah Baron, and Demarre McGill. During her career, Ms. Roberts has been privileged to study and perform across the United States as well as abroad in the countries of Canada, England, Italy, and Argentina. She has participated in the Aspen Music Festival and School, the Chautauqua Music Festival, and the Banff Centre for the Arts. Ms. Roberts has also performed in masterclasses with flutists such as Emmanuel Pahud, Michel Bellavance, Patrick Gallois, Ransom Wilson, Bonita Boyd, and Mark Sparks. Dr. Emily Roberts is recent winner of the Michigan State University Dissertation Completion Fellowship for her research in musicians' health. She was also a recipient of the Running Start Competition entrepreneurship award for her development of a sensory friendly concert series for individuals with intellectual and developmental disabilities in East Lansing, Michigan. In 2017, Ms. Roberts was named first-place winner of the South Carolina Flute Society's Young Artist Competition. She was also first-place winner of the Louisiana Flute Society Piccolo Competition and second-place winner of the Louisiana Flute Society Orchestral Flute Masterclass Competition in 2014. In the same year, she was named a winner of Meadows School of the Arts concerto competition where she performed the Martin Ballade. As a music therapist, Dr. Roberts currently serves all populations in the Hampton Roads area including children, adolescents, and adults with developmental disabilities as well as individuals with Alzheimer's, Post-Traumatic Stress Disorder, substance abuse, and depression, to name a few. She has extended experience in music therapy practice with veterans as she completed an internship at Charlie Norwood Veterans Affairs Medical Center in 2013. One of Emily's greatest passions is to merge her fields of music therapy and music performance to better the lives of all people. Outside of music, Dr. Roberts loves Latin dancing, yoga and Zumba, spending time with family, trying new foods, knitting, and going on hikes with her dog, Max the English Pointer. Find out more at https://www.emilyrobertsmusic.com/.